Why can't renaming of large number of files be as easy as editing text in a text editor? Renamer takes this simple idea into a whole new level. No wonder it become a favorite tool for more than a decade. Many people asked us to revive and update this old workhorse, so here it is. The Oscar's Renamer is one of our secret tools originally created only for internal use but later offered to public. One license is valid for all your computers at home. Renaming files can be a pretty dull task. Imagine renaming hundreds of files if there is no easy system to their names that can be simply defined by wildcards in renaming batch tools. Wouldn't be great if we can edit file names in a folder just as easy as a list of names in a text editor? This is exactly what the Oscar's Renamer does. You edit a file names in a folder as if it was a text on a page in a familiar full featured text editor. When you are happy, just press Apply and all the files are physically renamed. No unfamiliar wildcards or cryptic find/replace parameters. Multiple Undo/Redo, just like in a text editor! 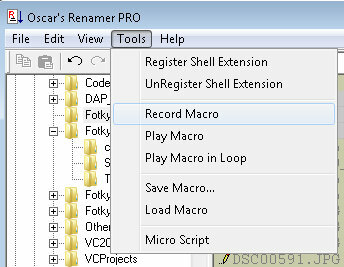 Working in Renamer is like working in a text editor with all the goodies of find, replace, Undo/Redo, macros or scripts. For the more geeky of us (looking at you Oscar!) Renamer offers not only easy to use keyboard playback macros but also a whole BASIC-like script interpreter to really go deep into the art of complex file renaming. Seriously, when everything else fails, this did save our day more than once. A Text editor where each line represents one file. You can simply move by mouse or arrow keys, make any changes, use Undo/Redo etc... the changes you made are highlighted. Either an Apply button on the top toolbar or Apply Changes in menu File. This will apply all changes you made to the file names. Even after you write all the changes to disk you can still go back by pressing this button. This will put the filenames on disk back to state before last Apply Changes. Reload the list from the disk and lose all the changes you've made. let's call it a Panic Button. A Combo box in the toolbar. You can either type a string there and press Enter or F3 to find the next string in the file names or select a string in the editor by mouse and press Ctrl-F3. Beside the Quick search you have also familiar Find and Replace dialogs. This tool can add itself into Right click menu in Windows Explorer. Simply run it and from menu Tools choose: Register Shell Extension Now if you right click on a file (not directory) in explorer you will get a Renamer item in the menu. For complex renaming operations and many files to process you may create a simple script using BASIC like language. Don't worry, you will not mess up your files. As with any other editing, It will apply the script on the file names in the text editor and nothing gets physically changed until you press the Apply Changes button. There is also a simple Test Run in the script that will do a test run on a test file names right in the script editor window for easy debugging. The BASIC interpreter is pretty solid not just some quick hack. It is taken from labTalk in DVD-lab PRO. You can record a keyboard macro and then play it back or save it for later. What is a keyboard macro? For example you want to delete a second and third character from each file name and replace it with string "oscar". You can record a macro to make it easier. Now you have your macro. You are already on the next line so simply press Play button. The next line will be treated the same way and because your last two keys were Arrow down and Home, the macro will always end on the beginning of next line. This is the whole idea of Keyboard Macro. You can save this macro for future in menu Tools. Macro is a powerful tool, hopefully you will find the beauty of using it. Note: only keyboard movements are recorded, not mouse! You don't make changes to the files during editing but only when you want. Press Apply and the file names on disk will be updated. The changed file names are all highlighted in the editor so you know exactly what you changed. A revert to original icon helps you to set the file name quickly back to original. You can record a keyboard macro and apply to the file names. 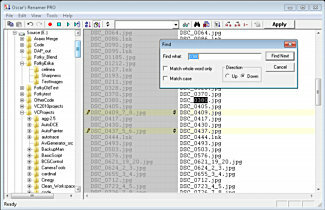 A keyboard macro is the fastest way to make similar changes to the file names. No wildcards or cryptic system to be learned. Just record keystrokes when you change one file name, then play the macro on other or all file names. You can also save the macro for future. This is a lightweight software, about as demanding as notepad or your windows calculator. It will practically run on any machine. This Evaluation Version is fully functional and doesn't expire. It features Macro recording, shell integration and the new Micro Script. Evaluation version displays a nag screen on the start. The full version cost only $24 and it will be yours forever, all updates are free forever, no nag screens. You can install it on all your home computers without paying any additional fees. No activation, no jumping through hoops. Easy deal! Limitations:: This is the old 100% free XP version of Oscar's Renamer that is dated back to 2001. It reliably works only on Windows XP. On Vista and W7 recording macro will freeze your keyboard/mouse, please use the PRO version! This old version doesn't have other features found in PRO like micro script. This old XP file works for Windows XP. CheCheck out our software to automatically turn your photos into paintings in the style inspired by world famous painters.